A carpet cleaner can remove embedded dust and dirt in carpeting much more effectively than a vacuum cleaner or a broom. These specialized machines are a must-have in any modern household. Did you know that buying a carpet cleaner is different to buying a vacuum cleaner? Rug Doctor is one of the bestselling carpet cleaners ever. It works on carpet, upholstery, car interiors, and stairs. Deep-set stains, pet odors, embedded dust, and debris. This carpet cleaner is designed to thoroughly clean heavily soiled areas. It’s ideal to get those stains off high-traffic areas like the living room. About 75 percent more suction power compared to similar products. This carpet cleaner has a 12-inch wide suction nozzle. It’s enhanced to remove dirt much faster without leaving wet stains. This cleaner also has dual-cross action brushes with 10 rows of bristles. These brushes are great for deep cleaning and removing embedded debris. The final results of using this cleaner are visibly more sparkly. It’s best compared to commercial cleaners than a household appliance. The cleaner polishes and grooms the carpet in the process of cleaning. However, it may chug up a lot of cleaning solution in the process. The Rug Doctor is very easy to use and refill. The tool caddy is removable, the water tank top opens easily, and maneuverability level is high. The Rug Doctor is rated CRI Gold. It’s rated best in class in cleaning performance. The water tank is small and requires a lot of refilling when cleaning larger areas. There’s some leakage that normally happens as well. 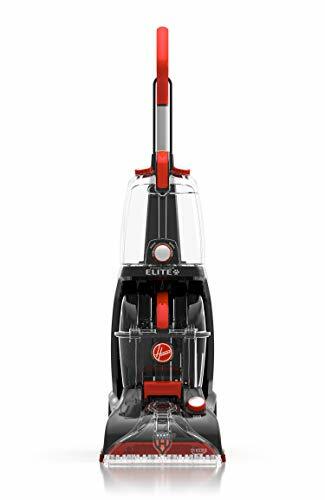 The main reason we loved HOOVER FH50251PC Power Scrub Elite is because it’s fast. It cleans carpets in a flash with no fuss or hassle. It’s perfect for homes with pets who shed fur no matter what. Some pet hair can remain on upholstery and carpets even after vacuuming. This Hoover would get rid of all that with the 2-in-1 antimicrobial pet tool. Even a seriously dirty and fur-stuck carpet can be cleaned in as quickly as 45 minutes. Plus, this carpet cleaner has a massive tank. Large areas can be cleaned with less frequent refills. A rubber nub for rinsing and stain removal, and a bristle insert for scrubbing tough stains. Combine the bristle insert with a high-performance detergent to give your carpets a commercial-level cleaning. The machine is lightweight. It weighs less than 20 pounds and is very easy to carry upstairs and downstairs. The downsides are rather minimal. The cord is too short to clean big areas without extensions. When the cleaning is done, the dirty water tank requires a good rinsing. Otherwise, it would cause odors that might seep into the carpet next time you clean. This particular Hoover stands out thanks to the SpinScrub brush system. It’s a system of rotating brushes that attack the stains from all angles for effective cleaning. 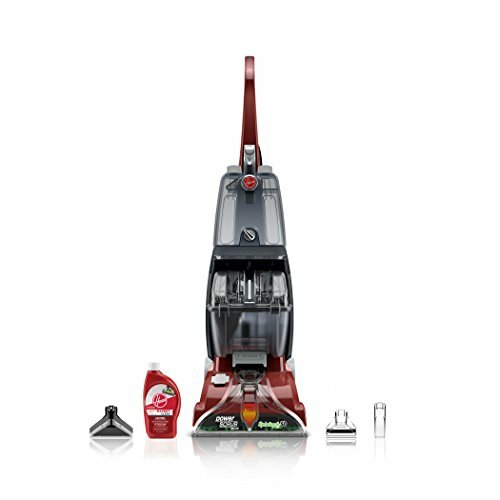 The Power Scrub Deluxe carpet washer is equipped with a DualV nozzle. It creates a very strong suction action that just grabs the stains off the carpets. The cleaner can be refilled and drained easily without any tools or making a nasty mess. There are two tanks for clean and dirty water to make refilling easy. And we didn’t have to bother about mixing detergent. The auto detergent mixing mode did it for us. This carpet cleaner also has a heated cleaning mode. In this mode, instead of water, the machine applies heat to carpets to remove stains. An 8-inch hose, upholstery tool, and a crevice tool. It’s very convenient for getting to the nooks and corners of a room. The machine is simple enough to use, care for, and carry around the house. The unit is prone to rust. The turbine system of the SpinScrub is made from non-stainless steel metal, so the parts are highly prone to corrosion. That causes this unit to be less durable than it should be. Otherwise, this is a high functioning and thorough carpet cleaner. HOOVER INC/TTI FLOOR CARE - Misc. This Bissell is comparable to the commercial Rug Doctor. 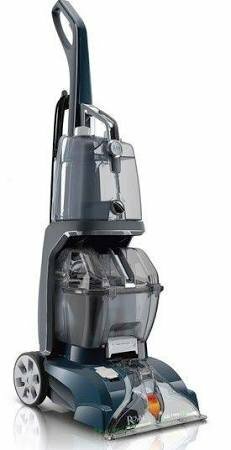 Similarly, it has a heavy-duty suction power to extract dirt and deep clean. It’s the DirtLifter PowerBrush. This massive brush delivers incredible scrubbing action that can remove embedded dirt, pet hair, and messes from carpets and upholstery. The brush is complemented with a tough stain tool. It sprays extra to get rid of stubborn stains on soft material. The cleaner is accompanied by a long 9-foot hose to reach just about anywhere. 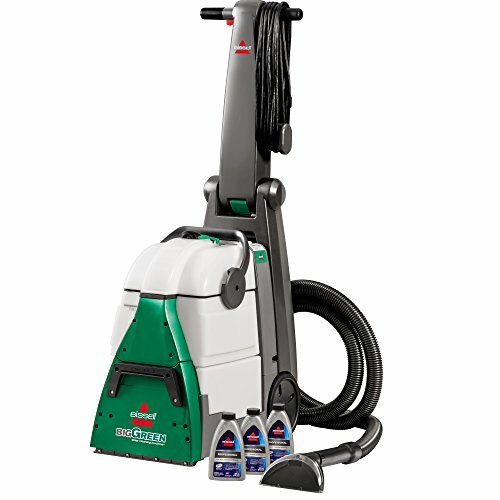 This machine can accommodate hose attachments from other Bissell models. This carpet washer has two large thanks. It can clean an entire floor without needing to refill multiple times. The tanks also keep dirty water and clean water separate. But the wonderful benefit of two tanks is canceled out by the fact that it adds weight. This carpet washer is very heavy and difficult to move upstairs. The plastic tanks do require thorough rinsing and drying after each use. Otherwise, it may start smelling bad, or worse, grow mould or mildew. This carpet cleaner comes with a 5-year conditional warranty from Bissell. But the warranty is nullified if owners don’t use the very expensive Bissell cleaning liquid, which is a major disadvantage in our opinion. This is one of the most versatile carpet cleaners we have come across. It works on soft surfaces such as carpets and upholstery, but also works on hard surfaces. That’s right; you can use this carpet cleaner on tile or brick floors as well. The over-molded rear wheels are designed to be easily maneuverable on hard floors. The suction power is not as amazing as the others mentioned above. However, it comes with a number of brushes and cleaning tools to get the job done. Antimicrobial brushes, spinning hand tool, upholstery brush, and a crevice tool. Plus, there’s a special tool included to clean the nozzle! The cleaner has a 30-foot power cord so extension cords would be unnecessary in most homes. It can create a cleaning path 11.25 inches wide. It has dual water tanks, each with its own detergent tanks. We could clean fabulously with the dual detergent system. The plastic tanks are very easy to rinse after a cleaning session. But it’s not always necessary. The downside is that the tanks are small. So expect to run to the sink to refill often. The machine is protected by a 3-year manufacturer guarantee. No conditions like what type of detergent to use apply. There are so many carpet cleaners available in the market with similar features, so making the right choice can be a challenge. Carpet washers are pretty similar in how they function. However, the machines are categorized into different types. These are massive carpet cleaners that you can rent out at department stores. These machines typically have powerful motors for excellent suction power. Commercial carpet cleaners are designed for use in places like offices. These machines are very heavy and may be too large to maneuver in small rooms at homes. A step above commercial carpet cleaners, these machines are huge powerhouses built for heavy-duty purposes. Industrial carpet washers are the largest in size because these are made to clean our big areas with few refills as much as possible. Home-use carpet cleaners are lightweight and less energy-intensive than commercial carpet cleaners. However, the lines between the two have been blurring in recent times. Most home-use carpet washers can now clean just as well as some commercial brands. The Rug Doctor and Bissell machines reviewed above are examples. Those for home use obviously, considering these machines are lighter and easier to use than commercial machines. The suction power of the nozzle and the hose determines how well it removes dust, dirt, pet fur, and other debris from carpets. A good suction nozzle is necessary to dry the carpets after shampooing. The more powerful the suction mechanism is, the sooner you will be able to get the carpets dry. 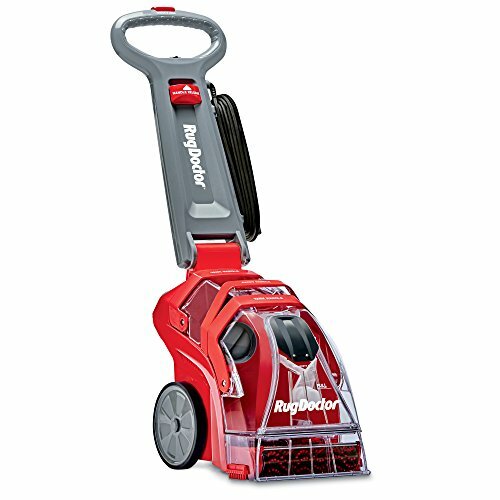 Look for a heavy-duty home-use carpet washer with a better-than-average suction mechanism to get your carpets thoroughly clean without wasting time. A good carpet cleaner requires at least two rotating brushes to do a decent job. The best-rated carpet cleaners have multiple rotating brushes. Read what the manufacturer specifies about the brushes attached to the machine. You can make your choice based on bristle count, brush type, and similar features. A small water tank means you will have to make constant trips to the sink to refill the carpet cleaner. A carpet cleaner with a large water tank is simply more convenient to use. Some machines come equipped with dual water tanks. These separate clean and dirty water for added convenience. It can add weight to the machine and make it difficult to move around the house. So balance the size of the tank with the weight of the overall machine. Most don’t easily clean crevices and nooks. The end result can look garish with the carpet looking shiny clean in the middle but with unsightly patches around. Therefore, look for a carpet cleaning machine that comes with plenty of accessories and attachments. Look for crevice tools and such that increases the cleaning range to hard-to-reach areas. Carpet cleaners work only on carpets, right? Well, you can get more value for your money if you can work the carpet cleaner on furniture and in the car too. Carpet washers with upholstery tools can clean soft surfaces on non-floor parts of your home as well. Some carpet washers can work on hard floors, too. So you don’t have to buy a vacuum for the hardwood, tile, or brick areas of the house. Want to eliminate germs off your carpets with hot water? Some carpet cleaners have an in-built heating mechanism. It would generate hot water as you clean, without needing to use the hot water in the sink. These machines can be very expensive, however. Buy one only if you don’t have a generous hot water system in your home. Also, some carpet cleaners have a heat cleaning function. It applies a burst of heat to a certain area you are cleaning. The high heat can dislodge certain types of stains. Plus, it will eliminate germs, bacteria, or mold pollen. Have multiple stories in your home to clean? Then you probably would want a lightweight machine. Portability is an important factor to consider when buying a carpet cleaner. When you have to clean multiple floors, you might want to choose a machine you can easily carry without dragging, especially up and down the stairs. Do check the weight, therefore, before deciding on a final product. Wouldn’t you love to have a machine that comes with a guarantee from the maker? Buy a carpet cleaner with a warranty to safeguard your purchase. The manufacturer would replace the products or supply parts if the machine malfunctions months after the purchase date. Carpet cleaners can be louder than vacuums. Therefore, make sure the decibel level isn’t unbearable when buying. Most carpet cleaners work with both cheap and expensive detergents. However, it’s better to be safe than sorry by checking out whether the manufacturer specifies a certain type of detergent for the machine. The carpet cleaner could end up being very expensive if the specified branded detergent is pricey. It almost always is. If you want to avoid using multiple extension cords throughout the house, which can be a tripping hazard, buy a machine with a long enough power cord. You might not be able to clean very well if the hose length of the carpet cleaner is too short. It should be longer than 3 feet. The user may have to uncomfortably bend down when using a machine with a short hose. To determine the best carpet cleaner for your needs, starts by assessing the size, weight, and capabilities of the products. Pay particular attention to suction power, reachability, and attachments that are included. How many water tanks there are can determine how conveniently you use the machine. Avoid branded traps. Don’t buy a carpet cleaner that makes you buy a certain type of detergent. What really matters is the power of the machine. Compare power to other features on offer, such as brush type and maneuverability. Don’t judge the product by brand alone. Do your research and choose the carpet cleaner that has features that align well with your needs.